Check out this infographic featuring your favorite horror movie villains including Freddy Krueger, Jason Voorhees, Leatherface, Michael Myers, Chucky, Pennywise, Ghostface, Candyman, The Fisherman, and the worst vampire Nosferatu. We get the signature film, favorite outfit, weapon of choice, preferred victims, and the brief description of the demise of the character. 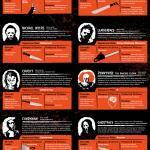 A fun infographic for all your classic horror villains.